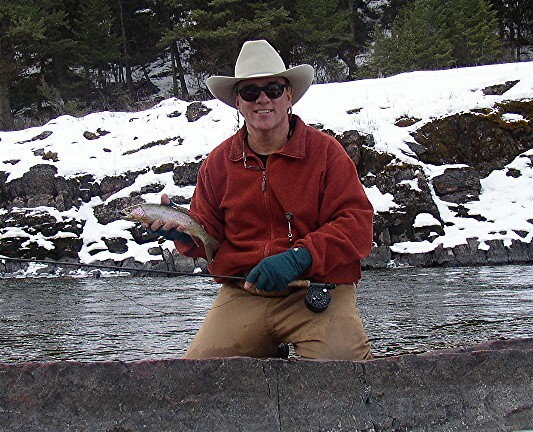 The Big Blackfoot is classic Montana water. 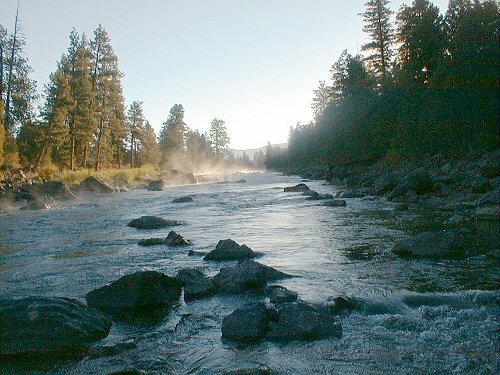 Clear, cold, and unimpeded by dams for its entire 110 mile length, the river winds through three canyons, past red rock cliffs and mountains, and alongside wildflower-laden meadows and prairies. Wildlife rare to other regions abounds here. 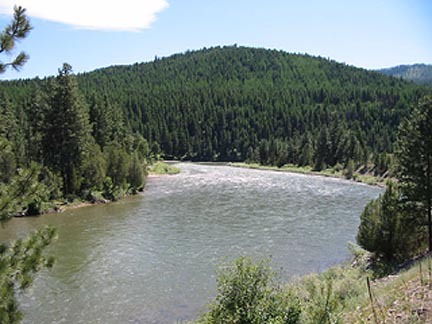 Grizzlies, elk, bighorn sheep, cougar, wolf and deer all call its valley home. 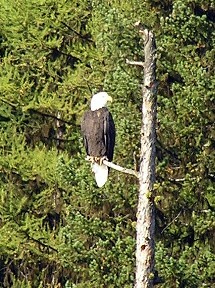 Bald and golden eagles regularly patrol the air space above. The Big Blackfoot in late spring flood as it leaves Nine Mile Prairie and descends into the beautiful and rugged 14 mile-long lower canyon. Our beloved Big Blackfoot, just downstream from the shop, in the grip of winter. 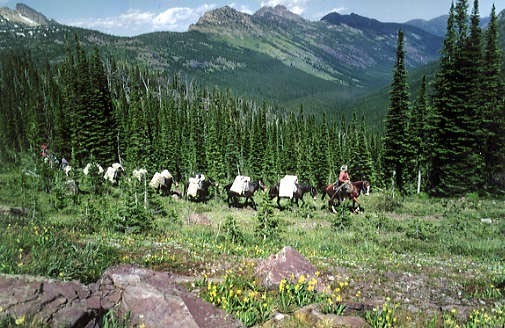 The Bob Marshall Wilderness, the largest wilderness area on the lower 48 states, forms the northern drainage of the Big Blackfoot. This area is roughly the size of Rhode Island, and is only accessable by foot or hoof. 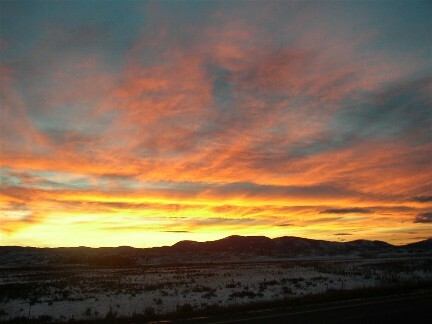 Sunset over the Garnet range, taken near the (in)famous Trixie's Antler Saloon in nearby Ovando. 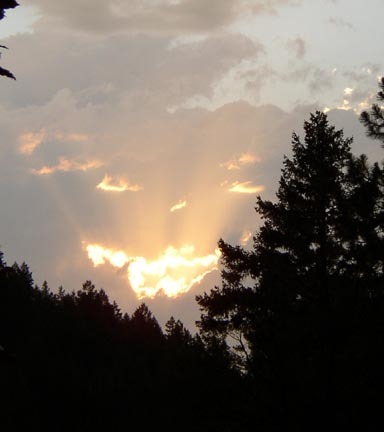 This Jack O'Lantern cloud didn't occur on Halloween -- it just should have. Seen during an August thunderstorm over the river. One of our many regular feathered guests, hanging out over "The Office" pool and looking for lunch. Even the boss keeps the occasional fish. 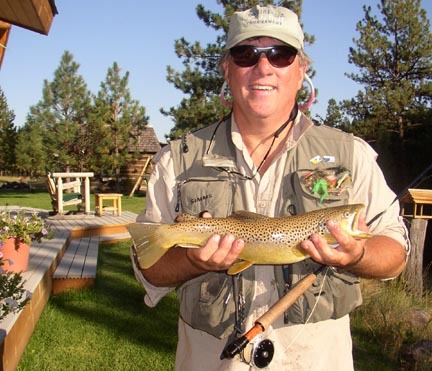 This 19" brownie was the only fish kept all last year, and only because he was the rare fish that didn't survive its catching despite a barbless hook. It met its tasty end shortly after the picture was taken, slathered in olive oil and garlic infused rice vinegar, rolled in brown sugar and spices, and grilled over an open fire. Another hard day of equipment testing, fishing within 100 yards of the shop. Bev Doolittle would feel at home here. 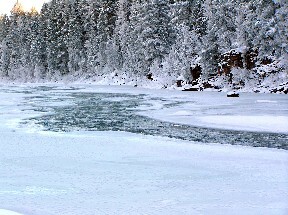 "River effect" snow in the lodgepoles and Douglas firs along the banks of the Big Blackfoot. Looking west down the middle of Nine Mile Prairie in March. 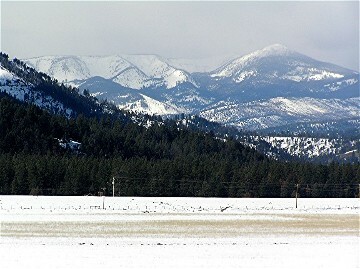 Sheep Mountain with its five glacial cirques is in the distance. The Big Blackfoot tracks along the base of the ridge on the left. Big Blackfoot Nets is just out of sight to the left.